WOW!!! It has been a crazy weekend, and I am exhausted!!! 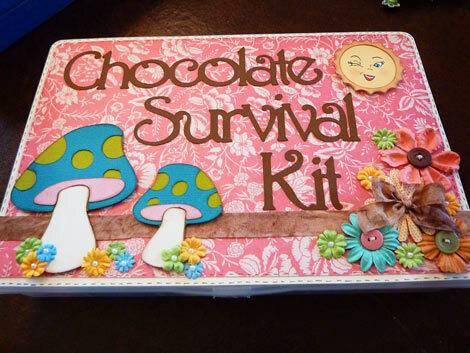 Went to a spring garden and gift show with my cards (and chocolate kits) yesterday and today. It was fun, but not very busy - I think the sun was shining too much for people to come indoors! Anyway, glad to be done with that, and moving on to some new things this week! 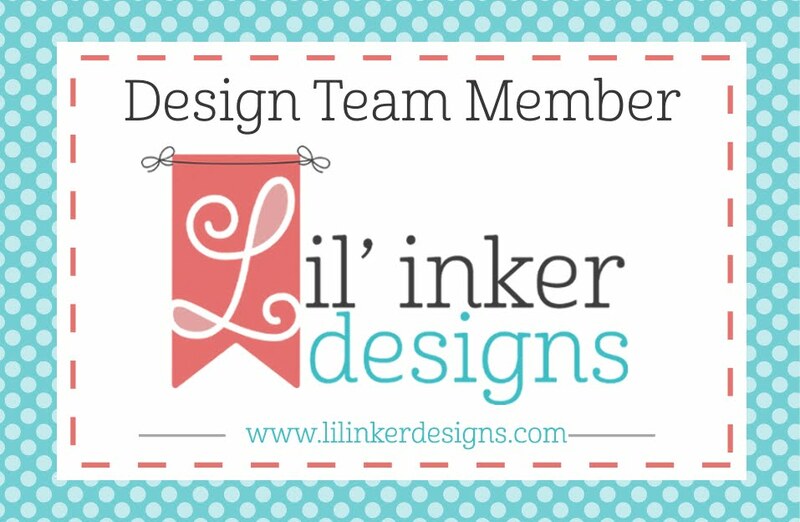 The first thing I wanted to announce, is that I have been chosen by Jalisa, over at Patches of Pink to be on her Design Team! 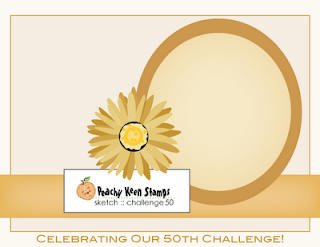 We will be creating our first project for the challenge this next week - so be on the lookout for that! 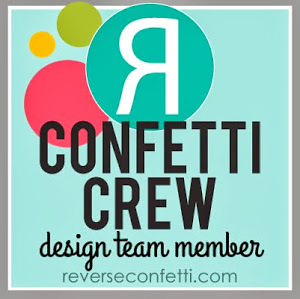 I am really looking forward to this new adventure - my first experience on a Design Team! Also coming up this week, I am participating in a Thanks Mom Blog Hop with Debbie over a Deb's Eclectic Thoughts, and a great line-up of other bloggers. 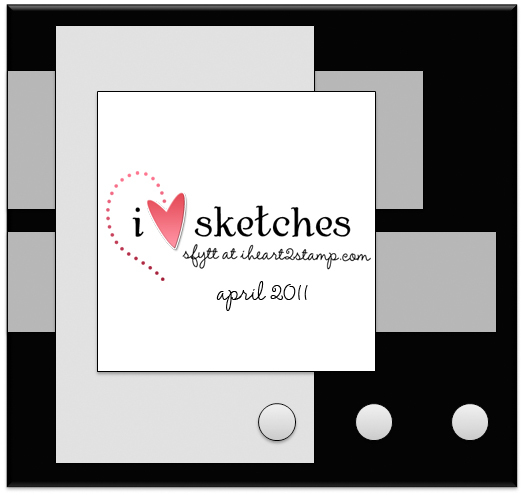 I plan on giving something away (I'm thinking a little bundle of some of my favorite things...but not sure yet! 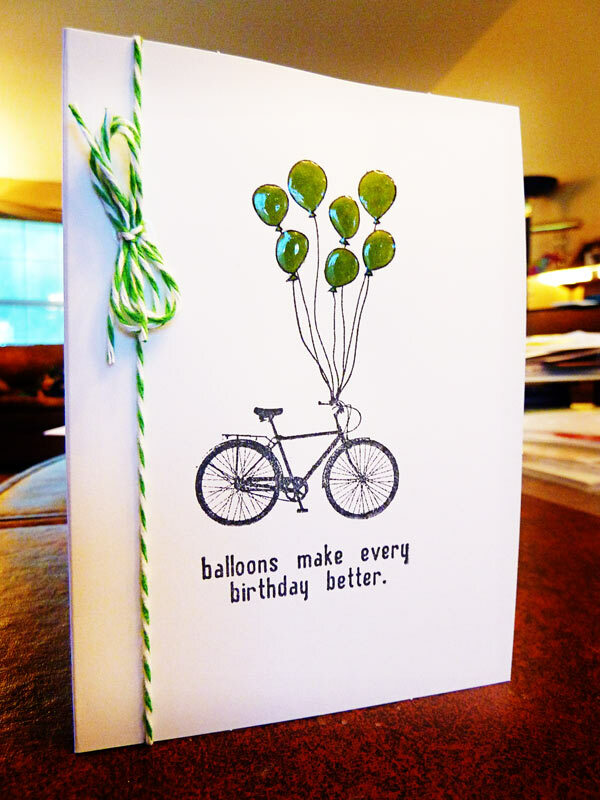 ), and there will be a grand prize from our host Debbie as well! As I was flipping through Cricut cartridge manuals on my computer yesterday, I saw this cut from Nursery Rhymes...and instantly though of My Creative Time's Mom You Rock stamp set - and this sentiment just seemed perfect for it! So...I had to throw it together real quick - while I was inspired! I am also entering it in the Mom's the Word Challenge at Fantabulous Cricut, to use the word mom, mother, mum etc... on a project. So...all cuts came from Nursery Rhymes. 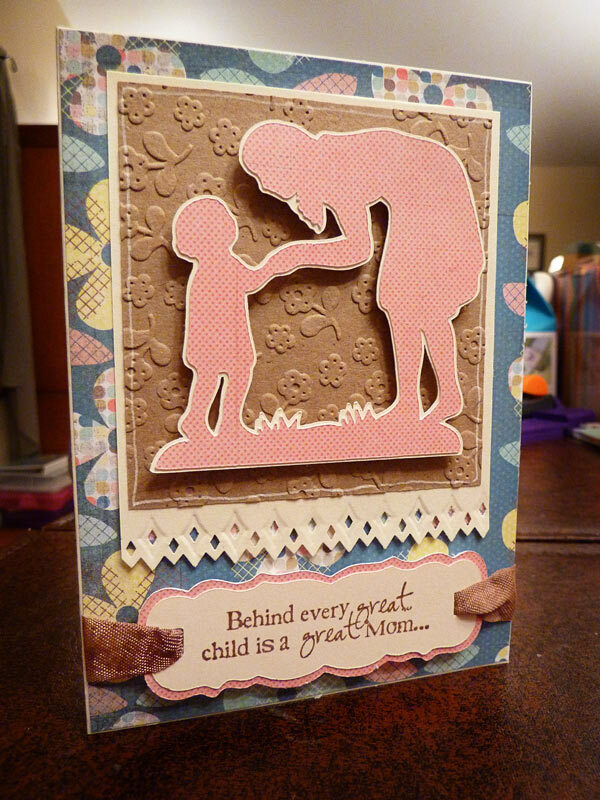 The sentiment was from Emma's stamp set "Mom You Rock." 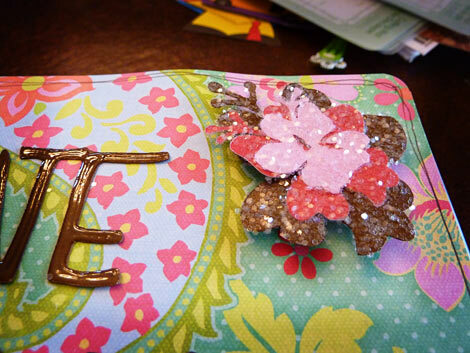 Added some doodling, some stick on black pearls, and some cute little pom-pom ribbon. Hello! I just wanted to take a moment to answer a couple of questions that I have been asked recently. 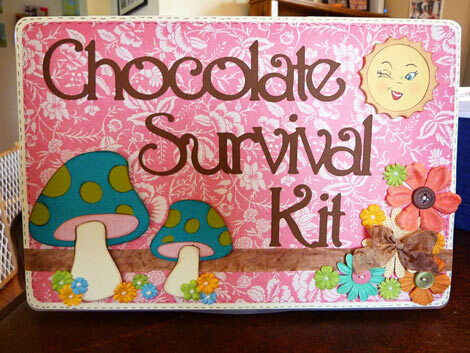 The first is regarding the chocolate kits that I made and their size. (Click HERE, HERE, and HERE to see them!) 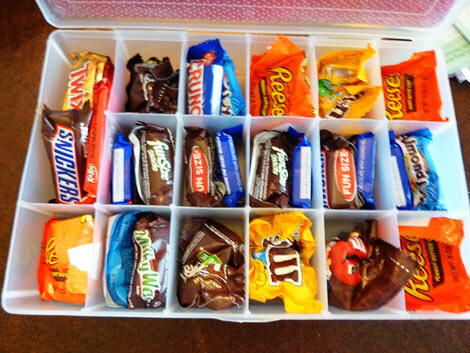 The box is just a bead storage box, or embroidery floss container. You can find them for $2 or $3 at Michael's or Joanns. The second question is about the Action Wobbles I use. (Click HERE to see them in action!) I got them from Peachy Keen Stamps. I don't see them on their website currently, so I don't know if they are out of stock maybe? Anyway, I know if you do a search you should be able to find them somewhere else as well. 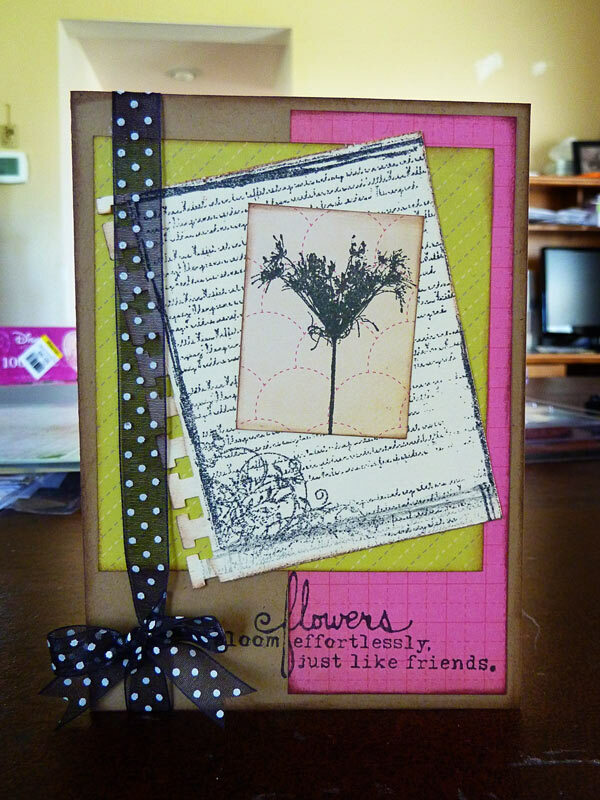 Just a couple more simple on layer cards to share this morning! Used the stitched border from the Unity Stamp January KOTM, and just inked around the outside, so the center stayed empty. 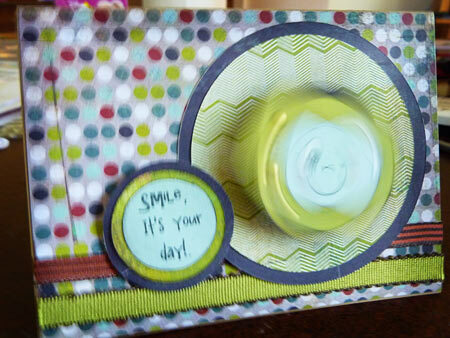 Then used some random stamps for the inside. 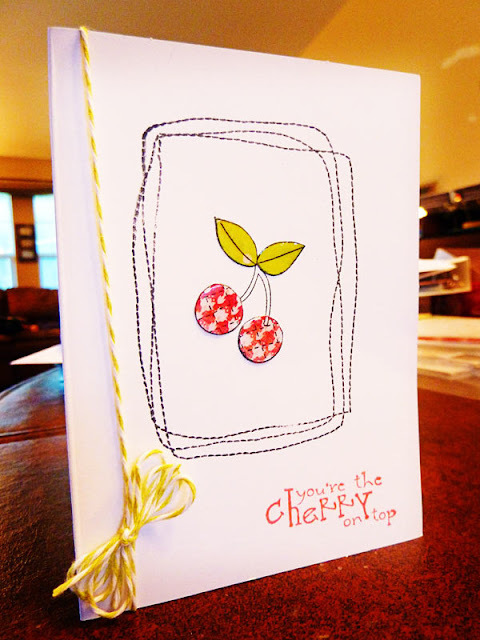 The cherry is paper pieced, then covered with Glossy Accents, as is the Happy one, and they both have a bit of Baker's Twine on them. 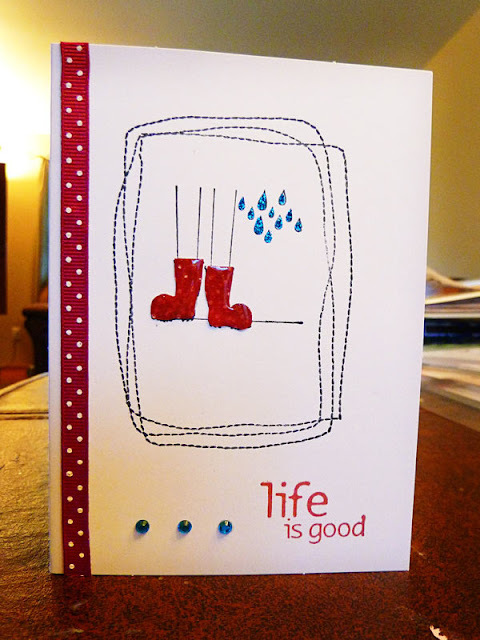 The last one I paper pieced the boots, added Glossy Accents to them, then used some Stickles on the raindrops. 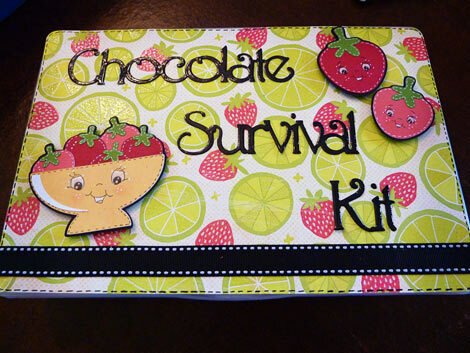 Finished that one off with a bit of ribbon, and some bling with my Jolee's heat set tool. 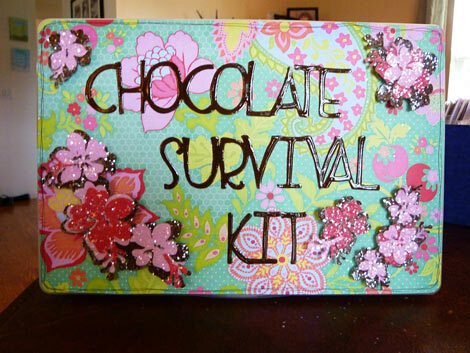 Mother's Day Gift #3 - Chocolate! Okay! Here is number three, and I think the final one! This one I am enterering in Cooking with Cricut's Wonderful Wednesdays Challenge - Spring flowers! For this kit, the letters are cut from Zooballoo (I think! 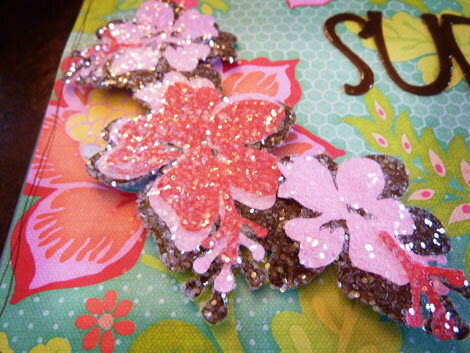 ), welded together on my Gypsy, and covered with Glossy Accents. The flowers are all cut from Storybook, covered with Glossy Accents and Martha Stewart glitter, then pop-dotted onto the top of the box. Added a bit of doodling around the edges to finish it off. Thanks for looking - and have a great day!!! 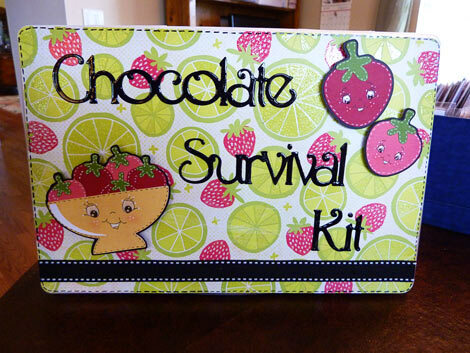 Mother's Day Gift #2 - Chocolate! Okay...here we go with post number 2! This one I am entering in two challenges as well: Creative Cutter Room's Design Time Thursday Challenge, to use all of the required elements from the Design Team Member's blogs, and Flaunt it Friday's - Cindy Loo, anything goes! For this kit, the letters also were cut from Nursery Rhymes, welded together on my Gypsy. 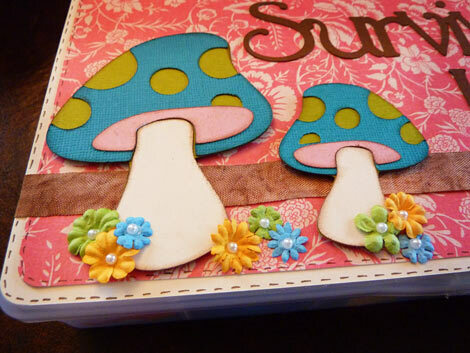 The mushrooms are from Cindy Loo, and the sunshine (with the cute Peachy face) is from Simply Charmed. I inked the edges of all the cuts, except the words. 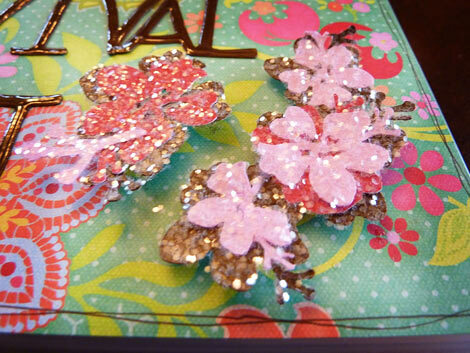 Added some Crinkle ribbon, LOTS of Prima flowers, buttons, stick on pearls, and some faux stitching around the edges. 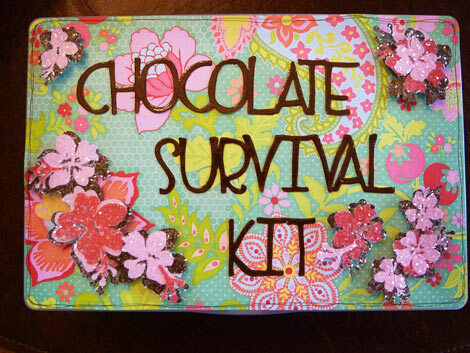 Mother's Day Gift - Chocolate! Hello! Guess I will be posting a LOT today, since I finally am getting caught up on some stuff and have a few challenges to post for...some of them ending today! 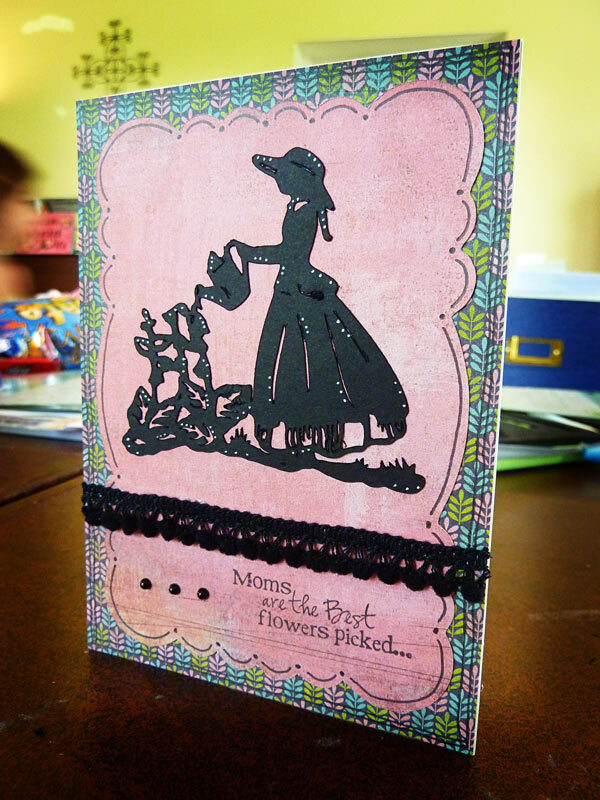 Been working on Mother's Day gifts and such for a Craft Fair that I am doing this weekend. 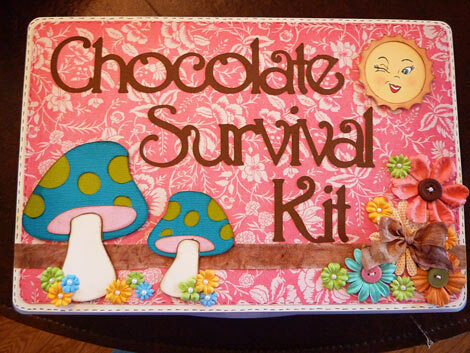 Been busy getting it all ready...amazing how much work it takes to prepare! Anyway, this is the first of THREE that I have already completed. I am thinking of them as Mother's Day gifts, but really, they could be for just about anything: baby shower, birthday, bridal shower, anniversary, or just because! 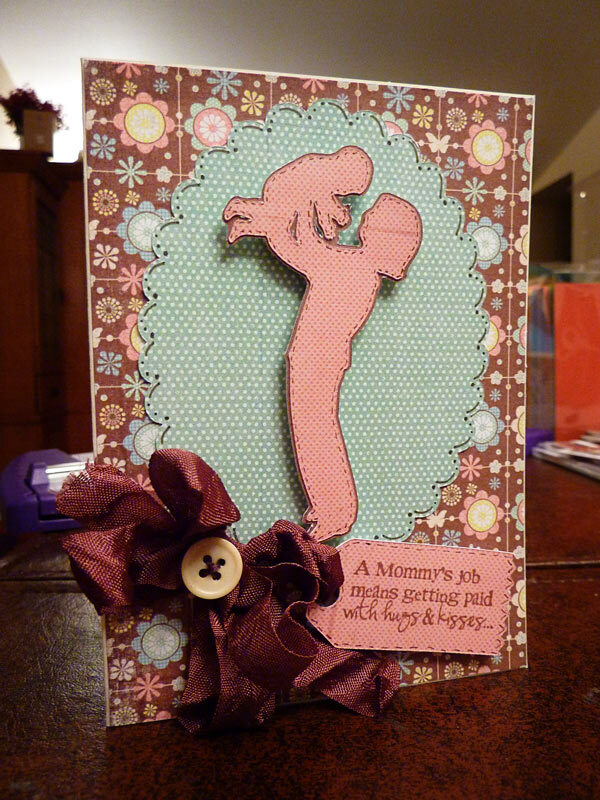 This first one I am entering in Peachy Keen's LFIF Mother's Day Challenge, as well as Scrapbookaholic by Abby's Challenge #4 - Mother's Day with faux stitching. Sorry for all the pictures - wanted to give plenty of detail! The words came from Nursery Rhymes cartridge, welded together with my Gypsy and coated in Glossy Accents. 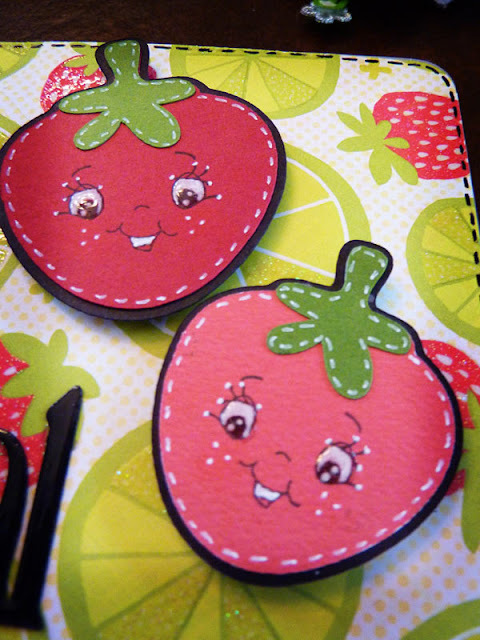 The strawberries, and bowl of strawberries is from Simply Charmed, and have Peachy Keen faces on them. Also put a bit of Glossy Accents on the eyes. I notices after I took these pictures that I forgot to color their tongues - so I DID take care of that! The strawberries and bowl are pop-dotted for dimension. Added some ribbon and faux stitching with my Sakura Glaze pen, and there you go! The other day I saw a card by Emily Leiphart on her blog Art from the Heart that totally inspired these cards! 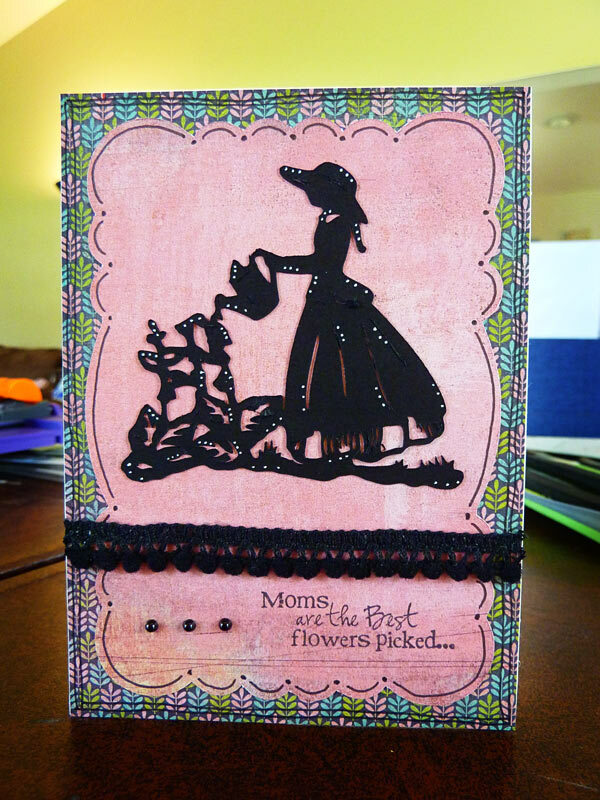 Click on the link to go see her card - SOOO pretty! This was a bit of a stretch for me to keep these as simple as I did...it was so tempting to start embellishing more...but I managed to restrain myself from trying to add too much to them! 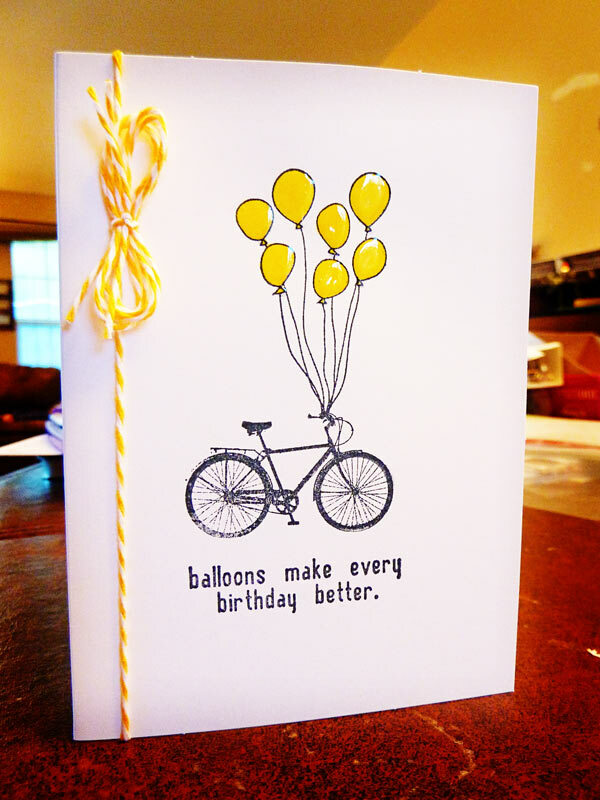 Anyway, I just stamped the bike and sentiment from Unity Stamps on a plain white card, colored only the balloons in a solid color, then covered the balloons with Glossy Accents. Finished off with a bit of Baker's Twine on the side. LOVE how simple and clean these are! 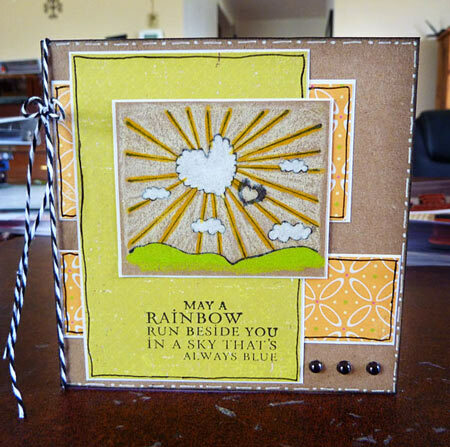 I had so much fun with the last card I made for the Inside/Outside Challenge over at My Unity Place. So...I ended up making another one! 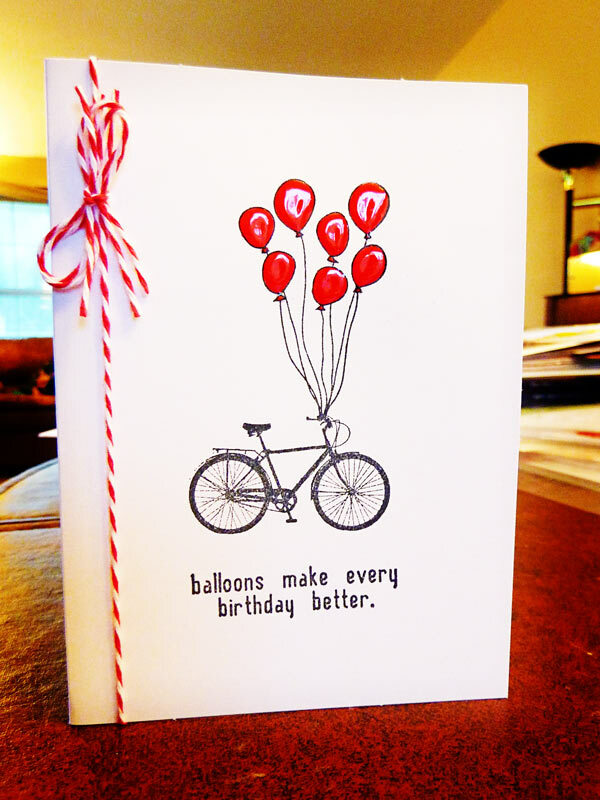 I love the idea of those few extra touches to the inside of a card - just makes it more special! 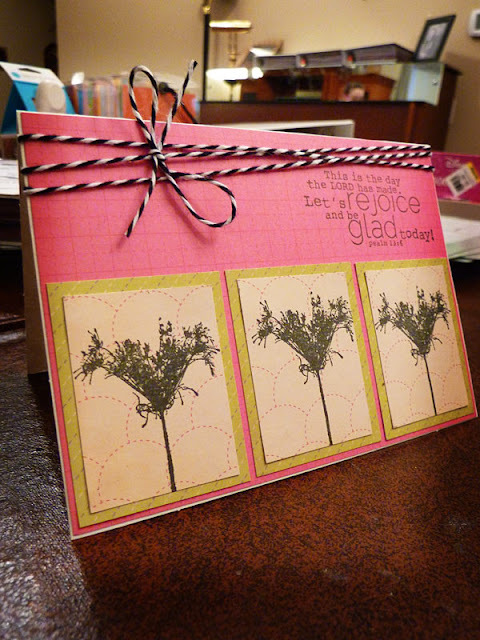 As usual for this card, I used my Unity stamps. The flower and sentiment are from the March KOTM, and the background stamp came from one of the grab bags that I got a while back. 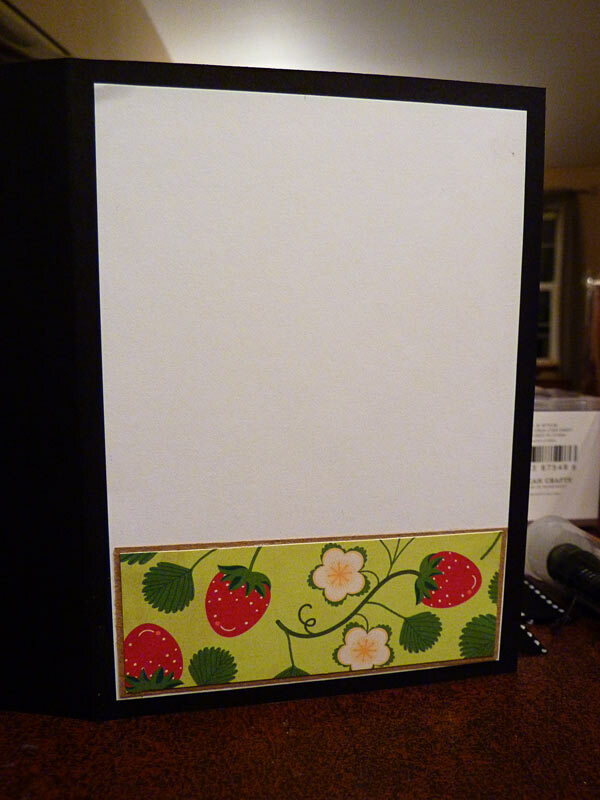 I used an EK success border punch for the notebook paper looking edges, used some inking, a bit of distressing with my Tim Holtz distress tool, and finished with a bit of ribbon. Enjoy your day - I am taking my two dear daughters today and going to visit our local Tulip Festival with a dear friend that I haven't seen in a long while! Did you know I have an Etsy shop? As with all my cards, 100% of the purchase price goes directly to build a house for a widow and her children in Burundi, Africa. Click on the banner below to go directly to my store! I am also running a special to help cover shipping costs. Purchase any 5 or more cards, and I will pay for shipping myself - and all your money will STILL go to Sister Connection. I also have a website where you can read more about what Houses Built of Cards is all about. 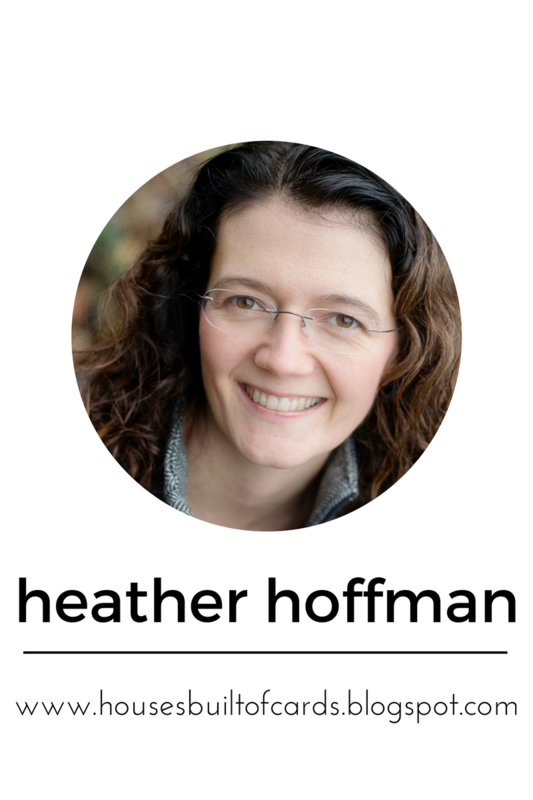 Just click HERE to read more! I also plan on doing a giveaway really soon, to help spread the word about my Etsy store, so STAY TUNED!!! 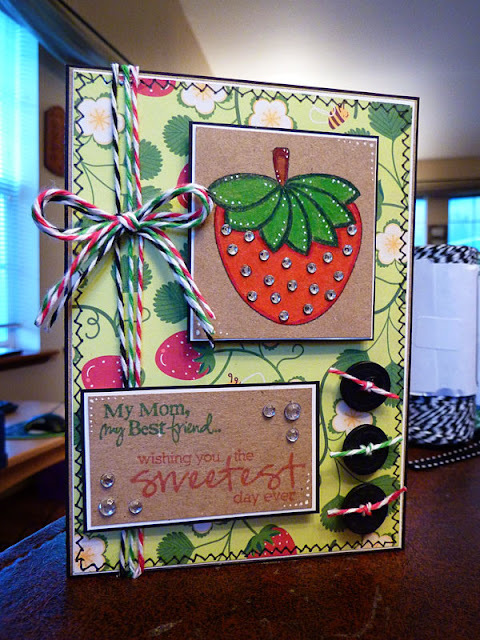 Yep - another card with Unity Stamps! I so LOVE all the cute images - takes all the work out of making cards for me! 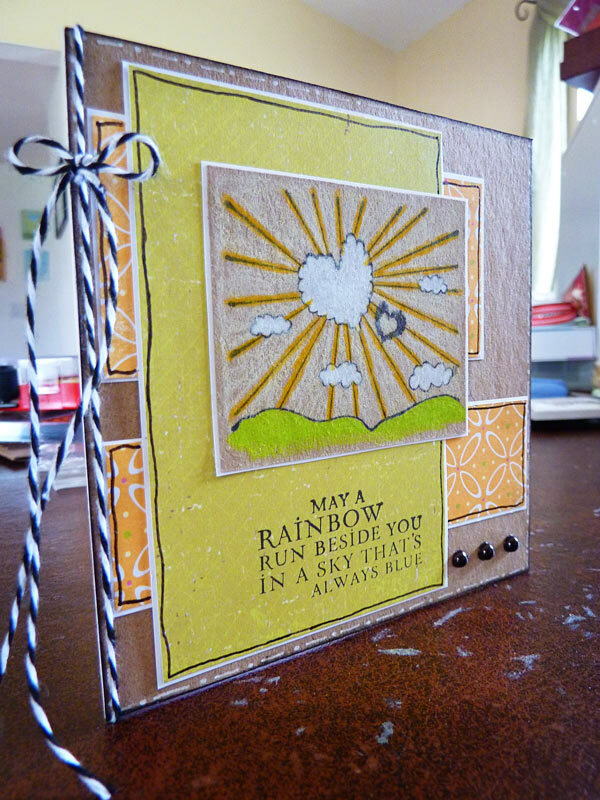 This image is just so HAPPY - looks like it is raining sunshine to me! The image is from a set called Happyville, and the sentiment comes from the February 2010 KOTM. I colored the image with my Prismacolor pencils, used my Tim Holtz distress tool on the edges of the kraft paper, then put the image on a Wobble - the pictures show a little of the action with it. Finished off with a bit of Baker's Twine, some stick on black pearls, and some doodled dots around the edges. So, all cuts came from Nifty Fifties. Sentiment is from Pink by Design. Added, of course, a cute Peachy Face and some ribbon. And...I couldn't resist, I put the TV on a wobble (LOVE 'EM)! The pictures at the bottom show a little of the action from that! Thanks for looking! And Happy Birthday Daddy! It feels like it is going to be a beautiful day here today! The sun is shining, and the birds are singing - spring must be here at last! Makes me happy! 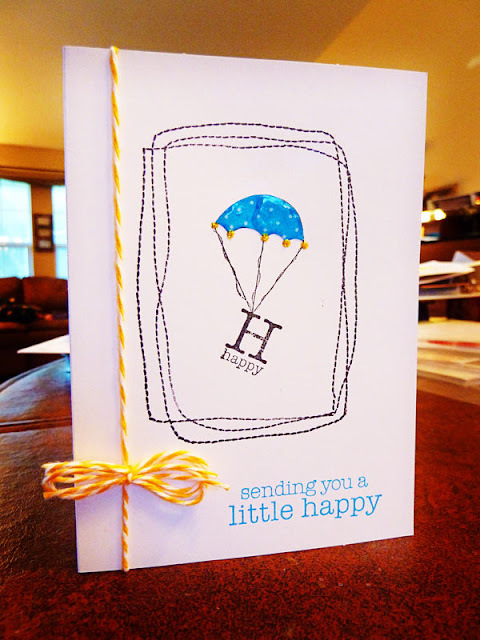 For this card I used my Unity stamps, colored the image with my Prismacolor pencils, and added some doodling. 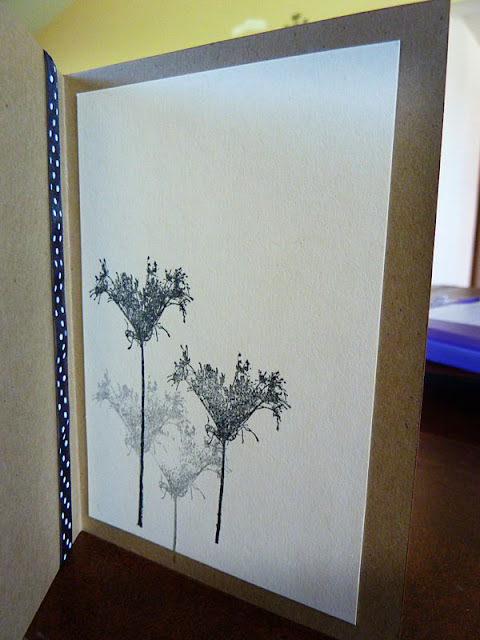 Added a bit of inking to the outside edges of the card, a couple of stick on pearls, and finished off with some Baker's Twine. Have a beautiful day!!! 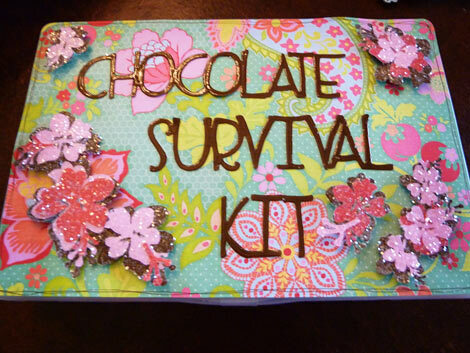 Okay...so this could be a lot more than an Easter card, but I was definately thinking of Easter when I made it! I used the sketch challenge over at All Things Unity, and boy did it help this card come together fast!!! As soon as I saw the sketch, I couldn't help but think of this stamp from the March KOTM. 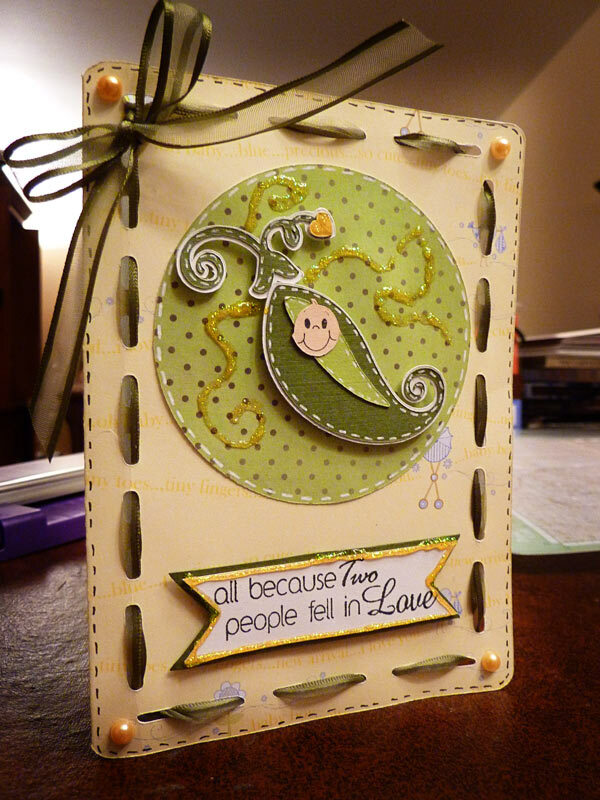 I added the sentiment from another stamp set, and added a bit of Baker's Twine. 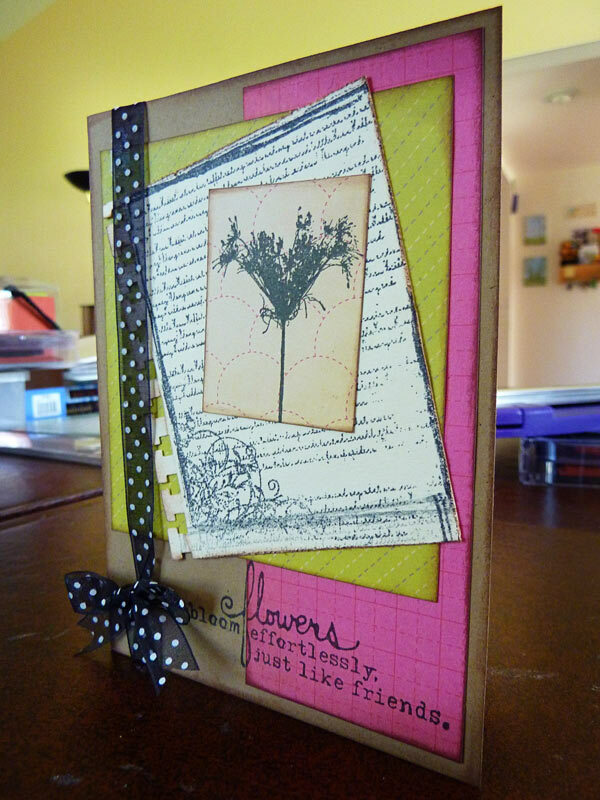 The paper is from a 6 x 6 pad from Cosmo Cricket called UPcycle - LOVE it!!! 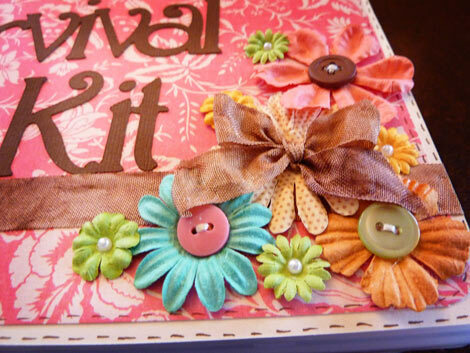 I am also linking this up to Friday Friends with Flair and the Patches of Pink Spring and Easter link up Party. Boy - I sure do LOVE my Unity Stamps!!! 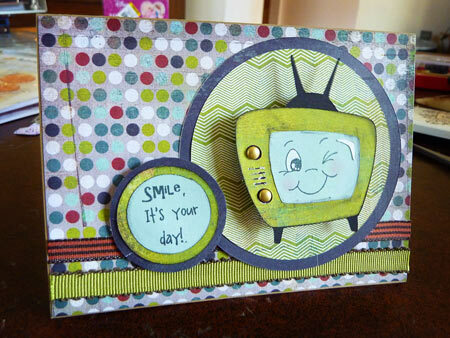 This was such a fun card to make - and I TOTALLY love it!!! 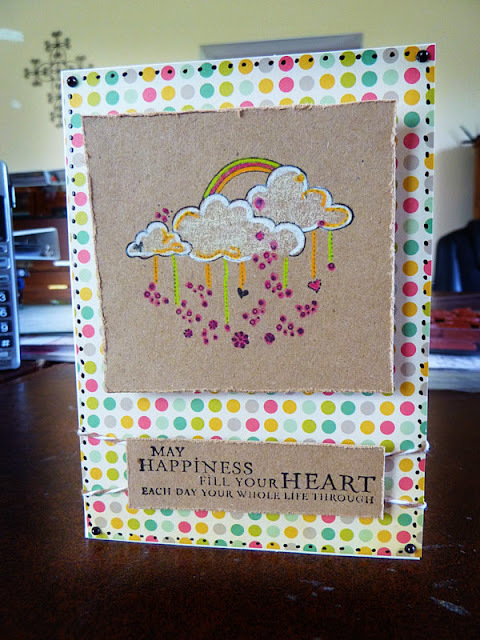 Also decorated the inside of this card a little, to enter it in the Inside/Outside Challenge over at My Unity Place. Used the Unity Itty Bitty set called "Sweetest Day," and added the first part of the sentiment from Emma's My Creative Time stamps. 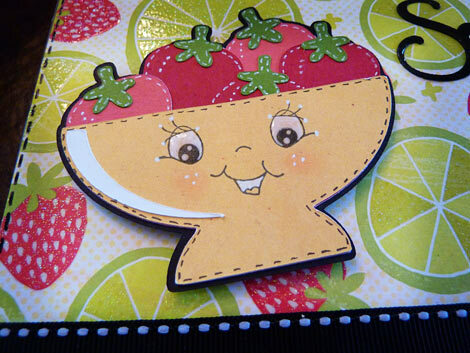 Colored the strawberry with my Prismacolor pencils, added LOTS of bling with my Jolee's heat set tool, and did many layers of matting (this is one thick card!). 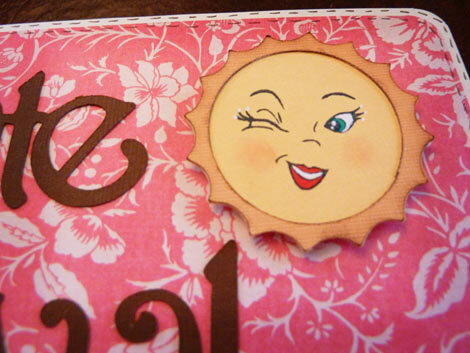 Did some faux stitching around the outside of the card (doesn't it look real though? 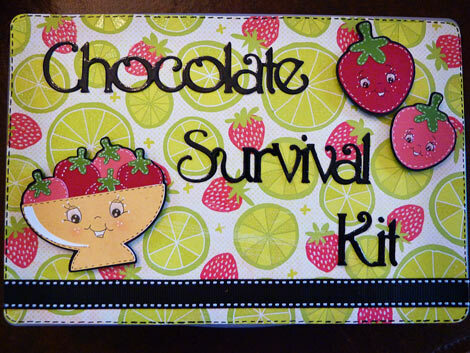 ), added some Baker's Twine, buttons, and a bit of doodling with my white gel pen to finish it off. I have only made 3 Mother's Day Cards this year, and those 3 have sold out! So...I thought I better get a few more made...and pretty soon I need to get my OWN cards made for my mother and mother-in-law. That can be a little more last minute though! I am entering these cards in this weeks Cricut Cardz Challenge - Mother's Day Cards, to make a Mother's Day card with any colors and cartridges you like. So, for both of these cards I used A Child's Year for all the cuts. 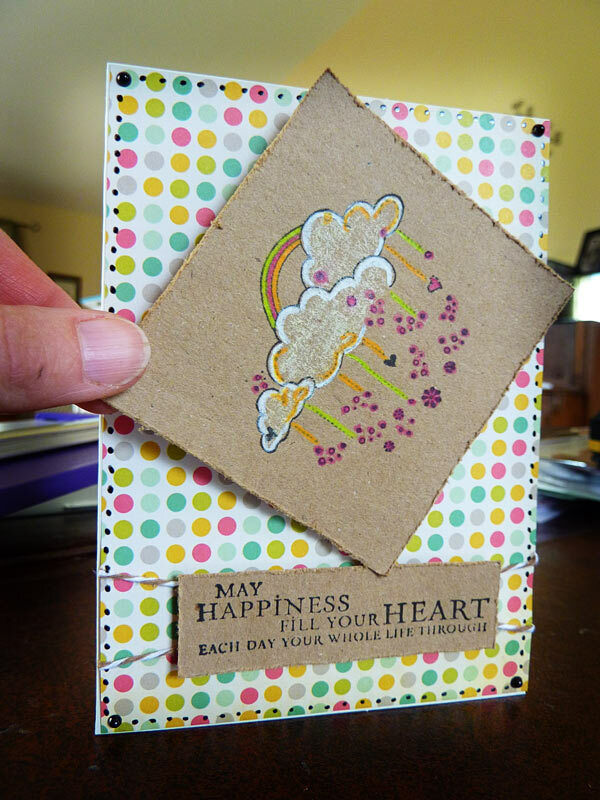 Almost all the paper came from Basic Grey - one of the 6 x 6 stacks that I have found are PERFECT for cardmaking! The first one I used my Cuttlebug on the background, and a Martha Stewart border punch that I found this past weekend at Ross - it punches and embosses, and was only $3!!! Love a good deal! There is a little bit of Crinkle ribbon on both cards, and the sentiments both came from Emma's (My Creative Time) stamp set called Mom You Rock. The second one also has a button with a bit of floss. Making a very hasty post tonight! I sat down to tackle some challenges, and started with the ones that ended the soonest...didn't realize until I was almost done, that one of them ends TONIGHT!!! 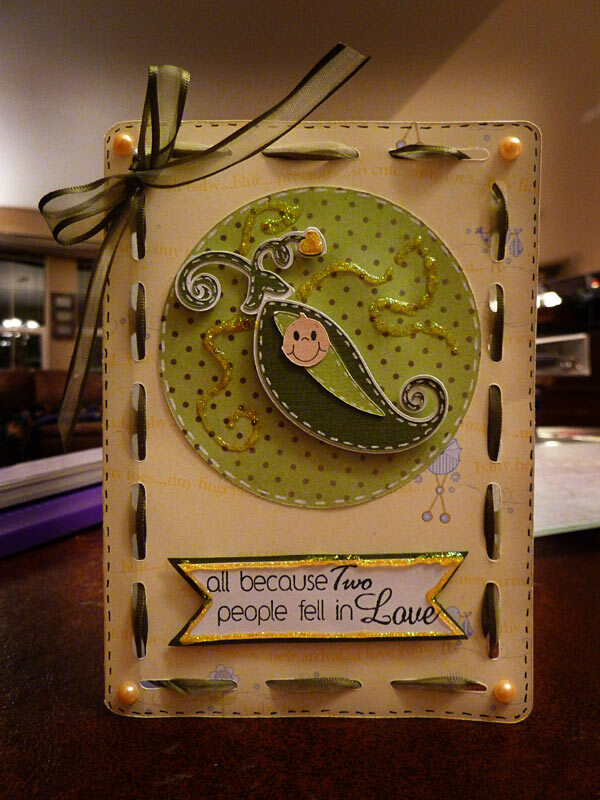 So...I wanted to hurry and post before I went to bed - hence the still wet Stickles on the card! 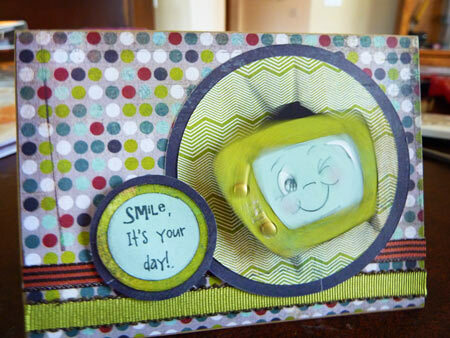 The first challenge (that ends tonight) is over at Scrappy Mom's Stamps Terrific Tuesdays - New Arrival. 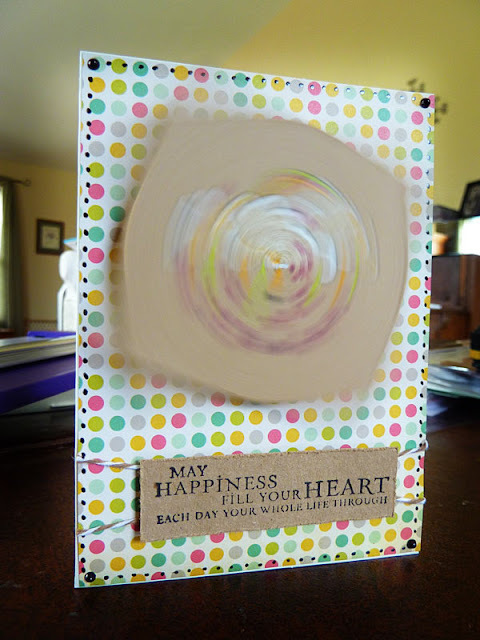 The second challenge is over at The Creative Cutter Room - to use ribbon, a circle, glitter, and the color yellow. 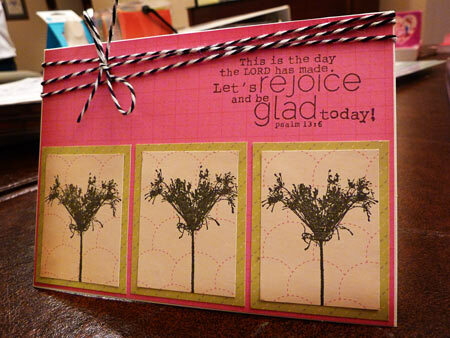 For the card, all cuts came from New Arrival. 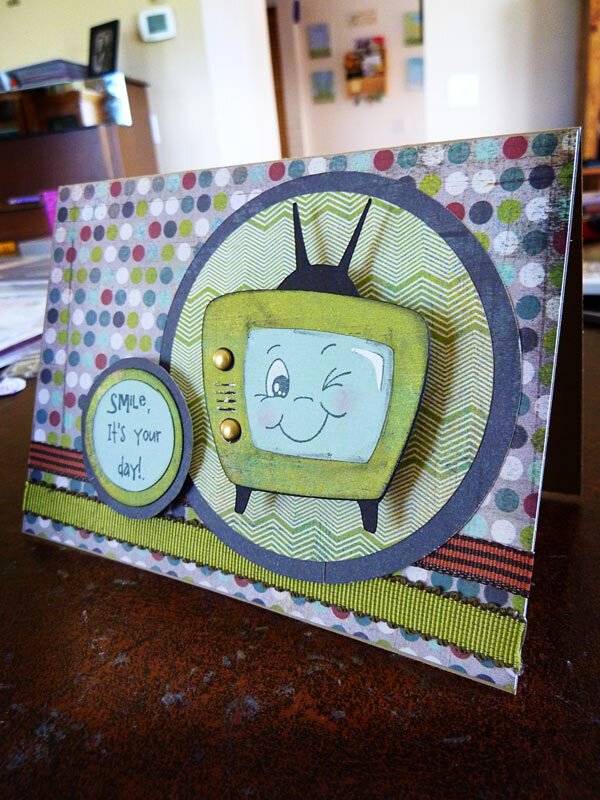 I added a Peachy face to the baby, some faux stitching, a stamped sentiment from Scrappy Mom's stamps, and ran the ribbon around the edges of the shaped card. I never even realized that New Arrival had such a card on it! Finished off with some stick on pearls in the corners. It's not my favorite card, but I think I will like it better when the Stickles dry too! Sweet as a bowl of cherries! One of my FAVORITE Unity stamps!